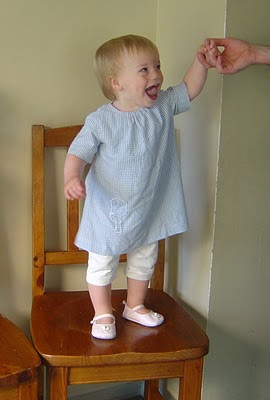 I thought I'd photograph this tunic (one of my designs) on Isabella, to properly show it's scale, proportions and fit. 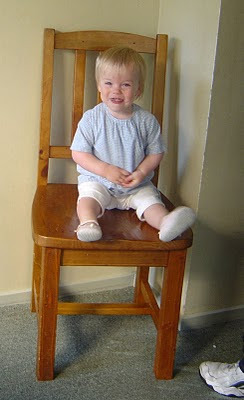 Ok I thought, I'll just get her to stand on a chair, snap a pic or two and we'll be sweet! Take 1: Cute, but she didn't want to stand up. That's Daddy's foot in the bottom of the picture as he cajoled and encouraged. Big beaming smiles, but no dice on the standing up thing. Take 2: Big sis getting in on the act, Daddy holding hand. Still beaming, still not keen to stand up. Nicholas looking interested in what all the fuss is about. Take 3: Woohoo! Standing up! Nicholas really wants to know what the big deal is, and Isabella is more interested in the faces Georgia is pulling out of the shot. Take 4; Bingo! Beaming at Daddy, standing up and body facing forwards to show the tunic nicely, and reasonable focus! Take 5; One more, to be sure. At this point she decided that modelling is for chumps and took off! And that was one of my more successful photographic sessions. Well done! There is an entire year where, if you looked at our photos alone, you'd swear we only have one child. 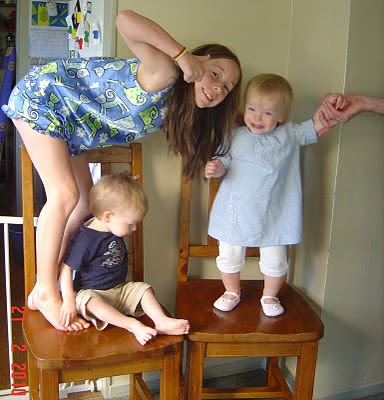 Because the other child could NOT be caught on camera. 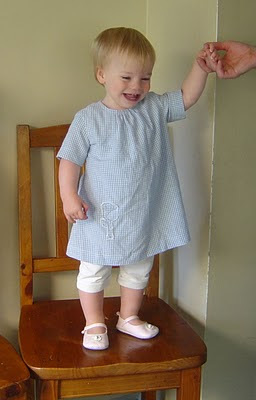 Sweet tunic! Your children are adorable. I cannot imagine how you find time to do anything other than what absolutely HAS to get done. I bow to you! 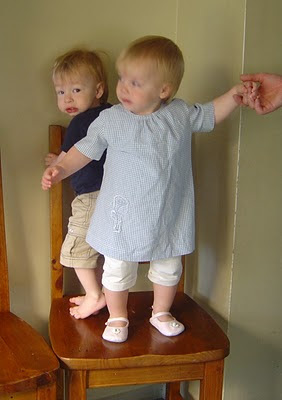 Beautiful children and a cute tunic too! Only 5 takes? LOL. It sometimes takes me that long with older children. The tunic is pretty and Isabella is such a cute model. You've got a lovely snapshot of their personalities with these photos. Cute! The one of the three of them together especially so. My daughter loves being snapped, and will pose like a pro. My son, who is normally a good-looking boy, pulls faces and pulls at the clothes. I am seriously considering making a dressform a la Tea Rose Home.